Every Holi, I make it a point to make a painting of Lord Krishna in some form. Pichwai is an art form (on paper or cloth) that narrates tales from Krishna’s life. The town Nathdwara in Rajasthan is famous for its pichwai paintings. 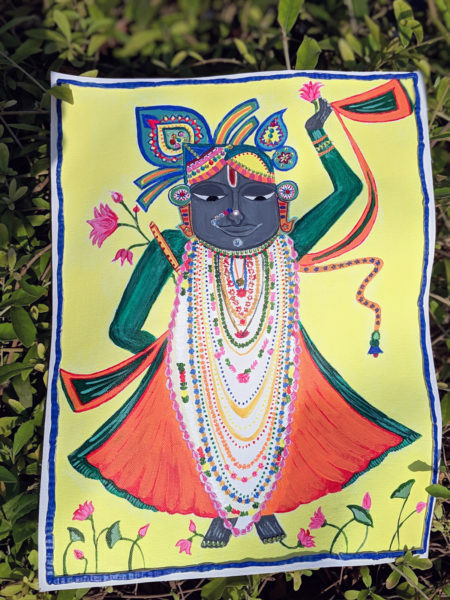 Ever since i visited the Nathdwara temple last December, i have been wanting to make a painting of the deity there, a 7 yr old Krishna named Shrinathji. Previous story Lippan work (mud and mirror) from Kutch ! All that glitters is not gold !